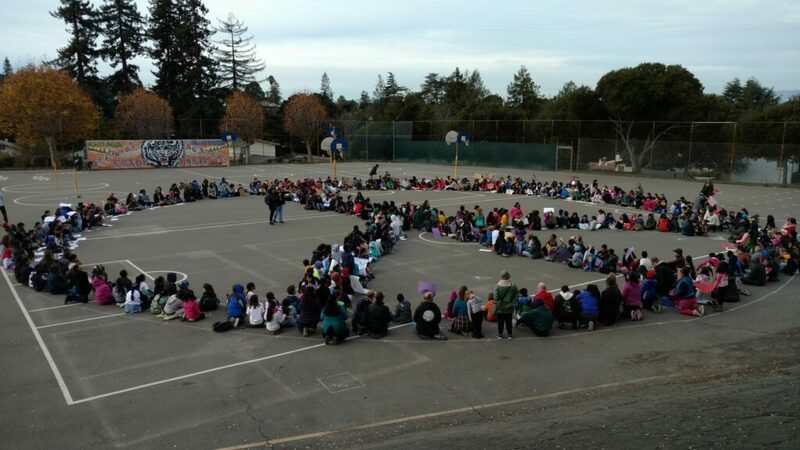 Recently, students at Melrose Leadership Academy in Oakland staged a peace demonstration. Based on EdSource interviews with dozens of teachers and administrators throughout the state, district officials say they’re expecting some reaction to the inauguration. In some classrooms, that might amount to a discussion about the peaceful transition of power. In others, particularly those in “sanctuary cities,” hundreds of students are expected to march out of their classrooms in protest of Donald Trump’s stances on public education, immigration and other issues. Leaders in those districts urged students to stay in school, noting that finals are either in progress or approaching, and encouraged teachers to plan lessons about tolerance, citizenship and democracy. In Oakland Unified, where protesting high school students are expected to join a larger rally downtown, Superintendent Antwan Wilson called for teachers to lead discussions about social change and the greater historical context of Friday’s inauguration. “These are unprecedented political times … We want to again stress that we believe the best place for our students is at school,” Wilson wrote in a letter to parents Thursday. Los Angeles Unified is calling for a “Unity Day” on Friday, with lesson plans on environmental, social and humanitarian topics, as well as restorative justice circles and other activities. Some of the Bay Area walkouts are being organized by an activist group called By Any Means Necessary, which is advocating “no ‘business as usual’ until Trump is defeated,” according to organizer Yvette Felarca, a Berkeley middle school teacher. “Trump’s inauguration day is a national and international emergency, and requires a mass emergency response,” she said. “This is a tough place we are in, and we are working to be sensitive to our families who are worried about their future while also doing our jobs of teaching history and civic engagement in a fair and unbiased way,” said Sarah Kirby-Gonzalez, who teaches 5th grade at Mather Heights Elementary. Teachers at Long Beach Unified, the state’s third-largest district, were urged to engage students in class discussions that are “respectful, appropriate and informative,” according to district spokesman Chris Eftychiou. Teachers received guides on how to discuss controversial topics in the classroom, understanding democracy and other related subjects. These steps are markedly different from the way many California schools marked the Barack Obama inauguration in 2009. Then, many teachers showed the event on TV as a historic, celebratory moment in U.S. history. On Friday, some teachers – particularly those with immigrant students – will decline to focus on the inauguration at all, saying it may create an unnecessarily tense atmosphere. Sarah Kirby-Gonzalez and her co-teacher of a 5th-grade class at Mather Heights Elementary, a magnet school in Rancho Cordova, opted not to show the inauguration in class. “This is a tough place we are in, and we are working to be sensitive to our families who are worried about their future while also doing our jobs of teaching history and civic engagement in a fair and unbiased way,” she wrote. Marciano Gutierrez, who teaches history and government at Alta Vista High, a continuation school in Mountain View, is having his students watch the inaugural address, write down their responses and share with their classmates how they want to personally ensure their own values are respected over the next four years. Bakersfield High School, which was among those that showed the 2009 inauguration on a big screen, won’t be showing the inauguration on Friday – it’s a teacher development day and students have the day off. Adams, who has written about the challenges of teaching students about this presidential election for the Huffington Post, said he will play catch-up on Monday. “We’ll do something simple: ‘Take a moment to reflect on where the country is and lay out your own aspirational message. Did President Trump meet it (in his inaugural address)?’” he said. Protests began on Thursday in some areas. Teachers unions in Los Angeles and the Bay Area staged rallies at about a dozen campuses for students, teachers and parents to voice their support for public education. Trump’s pick for secretary of education, Betsy DeVos, has been a longtime supporter of charter schools and school vouchers, and is opposed by California teachers unions. Despite DeVos’ support for charters, at least a few charter organizations are urging protests as well. Caliber Schools, with campuses in Richmond and Vallejo, is sending 12 middle school students and eight teachers to the Women’s March on Saturday in Washington, D.C. The trip is funded by private donations. “These students now have the chance to experience activism and community organizing first-hand during a pivotal moment in our nation’s history at our nation’s capital,” Caliber spokeswoman Cami Crawford said. At least one teacher is incorporating the inauguration into a final exam. Bryan Shaw, government teacher at Mt. Diablo High School in Concord, is asking students to make correlations between the electoral college and popular vote, the 2016 election and protests, the Supreme Court and constitutionality, and other topics surrounding the current political state. This story was written by Carolyn Jones, with additional reporting by EdSource reporters Jane Adams, John Fensterwald, Sue Frey and Theresa Harrington, Ashley Hopkinson. It is unfortunate that so many of our public education leaders failed to take advantage of this opportunity to stress one of the most impressive aspects of our great country. We have led the world in an ever-growing pattern of peaceful transition of power based on the results of free elections. Arguably the most powerful man or woman in the world (who earned that position by the ballot) hands over the keys to someone with the same political philosophy or the opposite political philosophy equally and with a smile (even if forced). Protesting that action with the school’s blessing is not “1st Amendment guaranteed free speech”; it is unwarranted miseducation. Wayne Bishop, I agree with most of what you wrote, except when you write, “Protesting that action with the school’s blessing is not ‘1st Amendment guaranteed free speech’; it is unwarranted miseducation.” Free speech is EXACTLY what it is, and it is warranted education NOT unwarranted miseducation. Americans are protesting the individual, Donald Trump, and the many prejudiced and revolting things he has said, NOT the inaugural process itself. You are extremely disingenuous in your attempt to paint protestors in a negative light, and as anything other than citizens expressing free speech. Also, why would you state something you couldn’t possibly know, and which, based on my own schools is not true? That is to say that many teachers did use this opportunity to talk about the inaugural process and how our government works – including myself, a lowly primary school librarian. Angela, yes, teachers are free to express their political views, but case law requires that they do so within the context of a balanced approach and not use their unique position within the classroom to proselytize their students. In this context one might discuss the much publicized ethical issues of the Clintons. I doubt that happened.